If you, your family, or your friends love chicken nuggets, there's no excuse to not know this recipe and do a healthier and tastier version at home. I love it because the tender chicken breast (which does not have much flavor on its own), is deliciously complemented both in taste and in texture by the fried coating. - Slice the chicken breasts into thin slices. The trick to simplify the preparation is to make sure that the slices are very thin (gently use a meat tenderizer to get them there, if needed). Once these thin slices are covered in batter and are frying, you'll know when they're done simply by checking that the coating is cooked (it turns brownish). - Break the eggs in a bowl, and mix thoroughly. Add the spices and the optionally the sesame seeds. Stir and make sure the batter is uniform. - Spread the flour onto a plate. We will use it to help the batter stick to the chicken slices. - Heat up the cooking oil in a pan. You want the cooking oil to be about a quarter of an inch deep. 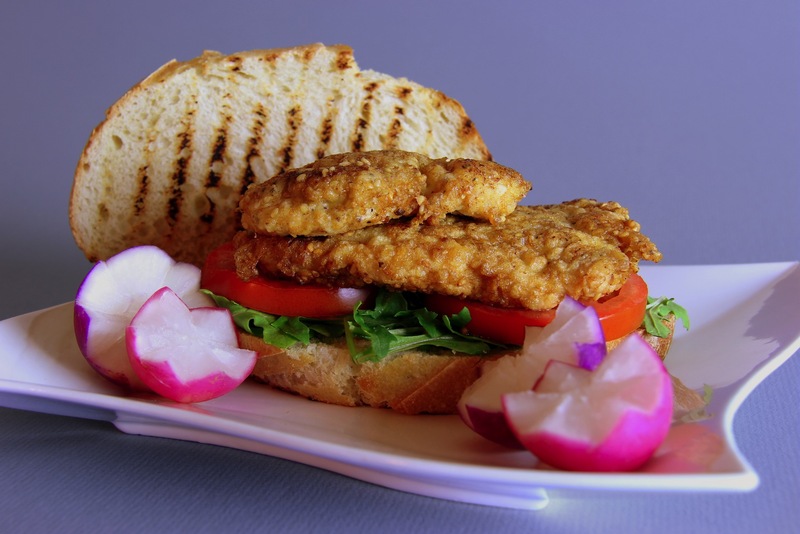 - Pick one slice of chicken, and cover it with a thin uniform coating of flour. Dip it in the batter, then fry on one side until it turns brownish and looks ready. Flip over, and cook the other side as well. Remove and place on a paper napkin (to absorb the extra grease). - Repeat for each slice of chicken breast. You can also cook a few at a time, depending on how large the pan you use is. - If you prefer a crispier coating, add some bread crumbs to the batter. - For best taste, you really want to serve them hot. - Note that the recipe in itself does not have much color, so you really want to strategically place some colorful items nearby. For example, if you place a plate of schnitzels in front of your guests, make sure you add a variety of color via fresh tomatoes, radishes, bell pepper strips, cucumbers, or scallions. During the cold Romanian winter, we'd choose an assortment of colorful pickled vegetables to go with it instead. - An alternative serving is as a sandwich (as pictured above). Here, I lightly toasted the bread slices, and used arugula, tomato slices, and mustard to complete the sandwich.